I come to you today as Notre Dame de La Salette, for I want to bring you back to France and to the French Alps, where I first appeared to the children in 1846 and to you many years later. My Messages at La Salette are as timely now as they were then. Remember I told you that there is a timeliness and a timelessness to my messages to the people of the world. Now the timeliness of my message to the people of the world today has to do with the loss to your world of so many of God’s children through the scourge of abortion that the evil one has unleashed upon humanity, particularly now in these End Times. Now the evil one has many minions among you who are zealously anxious to serve their evil master in these end times. Stealthily and quietly and without moral authority, they have garnered their evil cohorts to unleash abortion on demand upon the people of the world. As a nation, you have seen in the United States that the followers of satan have come out of the dark and into the light of lucifer celebrating and relishing their culture of death and asserting ever more demandingly and feverishly their plans to murder the children of God at all stages from the inception and beginning of life up until and including the actual birth of God’s children, who they have now deemed as free game in the slaughter of innocent lives. Woe to those who are acting in satan’s stead as his minions, who are promulgating and instituting this barbaric ritual of playing god over the lives of many of your brothers and sisters who are being slaughtered under the banner of ‘reproductive choice’. Hidden behind their frenzy in this culture of death, the most hideous monsters of the dark world have now come forward into your earthly realms to provide powerful yet dark energy that is fueling the sub-consciousness of those who are promulgating this culture of death. The despicable satan is in his soon-to-be-destroyed glory, now that he has subverted so many of God’s children and has converted them to his evil ways to the point that these souls are so lost now with scales before their eyes that they are even celebrating in public that they are militantly hell-bent on killing the lives of so many of God’s children. Not since the ancient and paganistic times has satan been so successful in converting so many of God’s children to following the culture of death. Many of them are still celebrating secretly in their occult ceremonies where they are feasting on the blood of the innocents in a vile and loathsome ritual that the evil one has gifted to them as an affront to your Lord and Saviour, Jesus Christ, and to the Holy and Sacred Mass of My Son’s Church. You must become aware of the reality of the evil in your world so that it is obvious to you that your civilization now is not as civilized as you once thought it to be. There are those of satan’s church among you who are practicing the ancient secret and occult sacrificial services of the church of satan, and they are beginning to surface before your eyes. Don’t turn away from the awareness that the most despicable behavior of satan’s minions is not only taking place now but is being flaunted by satan’s minions in your face. Basically, they are savagely returning to the ancient occult practices in worshipping the evil one in his many disguises: satan, lucifer, moloch, and baal. Awaken to the knowledge that the most perverse practices of the ancient enemies of the Father in Heaven are being resurrected in these End Times. The despicable satan knows that his days are numbered, and he and his minions are about sacrificing as many of God’s children as you allow them to get away with. They know that their days are also numbered if they do not forcibly take control of your institutions, your schools, and your governments. Watch what they are doing now, for they are so flagrantly flaunting their evil ways. God’s plan will defeat the evil one and his minions, but He needs the assistance of the Powerful Prayer Warriors who will step up to the challenge in these end times to defeat the enemy. You know who you are. As I had warned many decades ago at La Salette, many of the cardinals, bishops, and priests were headed to perdition because of their impure behavior. 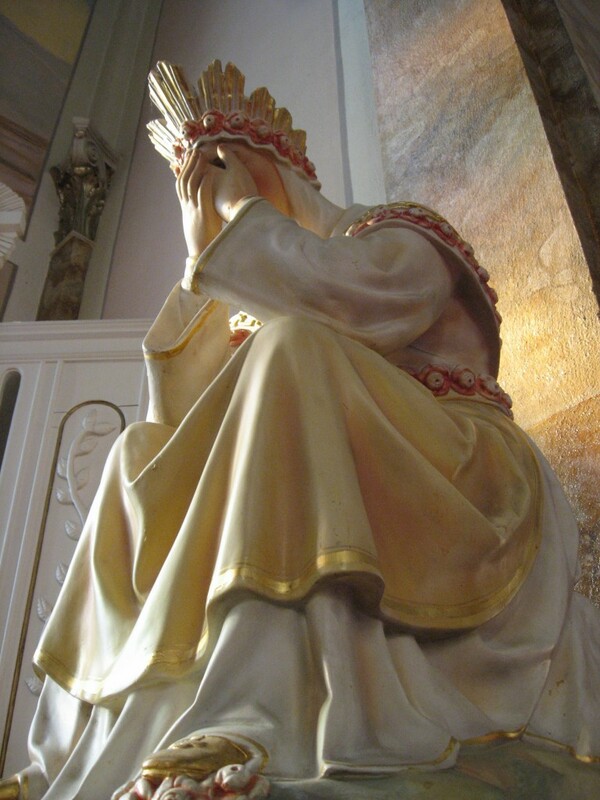 I had warned the children of La Salette and I warned you many years later that the failure of the leaders of My Son’s Church would result in a great crisis. Now you understand, for the great crisis is before you. As I said then, I say now: My Son’s Church is in need of great priests with forbearance and fortitude, patience and solicitude, and the love of the Father in Heaven to come to the aid of all of God’s children in these end times – particularly those priests who have the gift of discernment and the strength to perform exorcisms to cast out the demons. For in these end times now, all of the demons of hell have been unleashed upon humanity and it will take the leadership of many great priests supported by you as Powerful Prayer Warriors to begin to defeat all of the evil in the world in these end times. Do not despair, for I am with you. Know that the Father in Heaven through His Son the Redeemer and through the power of the Holy Spirit is with you in these trying times. The story of creation – as it has been written through the ages up until these end times – is written in stone. For in the end, the Father in Heaven will reign over the Earth, and the evil one and his minions will be cast into the eternal fires, as it has been written in the ancient texts. Therefore, the Father in Heaven shall prevail.